What would you do if a customer made a pass at your colleague? David Pease, senior vice president and director of talent, diversity and inclusion at Bangor Savings Bank, participates in an activity during Green Dot Bystander Intervention training at Bangor Savings Bank's headquarters on Nov. 5, 2018. The training aims to equip employees with skills to intervene when they're bystanders to workplace harassment. This was the scenario that Meghan Leonard, a customer experience development coordinator at Bangor Savings Bank, presented to nearly 25 bank employees on Monday at the bank’s new Bangor waterfront headquarters. 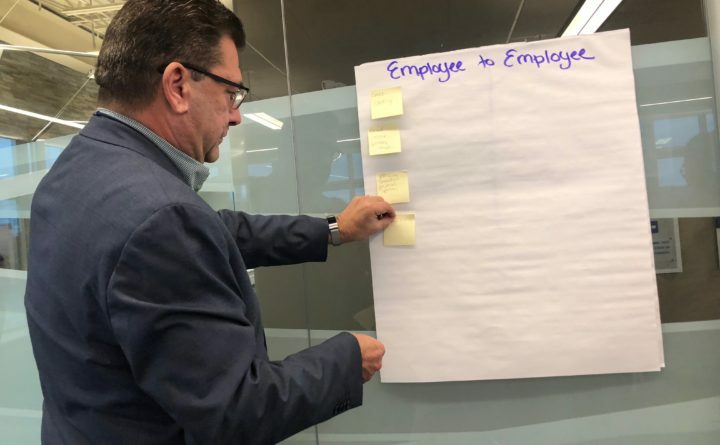 Leonard motioned to laminated signs on three walls of the conference room: “Not responsible,” ”Less responsible,” and ”As responsible.” She asked the employees to leave their seats, stand next to the sign they agreed with and justify their choices. Bangor Savings Bank, one of Bangor’s largest employers, is among the first large businesses in Maine to offer employees training in what to do when they find themselves contemplating whether and how to intervene when they witness harassment or acts of violence. Bangor Savings is offering the Green Dot Bystander Intervention training to all employees and making it a part of orientation for all new hires. The training encourages employees to think about their responses to violence or harassment and take a stand against it in their own ways, she said. “Going through the actual training was very engaging, which is not what you’d expect from typical harassment training,” she said. Leonard is one of the 22 employees at Bangor Savings Bank who went through the process of becoming a Green Dot trainer so they could educate other employees from the bank’s approximately 60 branches. The bank will hold training sessions at several of its locations across Maine and in New Hampshire, President and CEO Robert Montgomery-Rice said. He said that 300 employees out of 920 had already participated in training sessions. David Pease, senior vice president and director of talent, diversity and inclusion at Bangor Savings Bank, is in charge of the training sessions. During Monday’s session, he handed out tokens to employees when they participated or answered questions. “We’re trying to create a culture here that says if we see any behavior that’s bad, let’s address it and stop it before someone is really harmed,” he said. Research has shown that employees who receive this kind of training are more likely to try and stop violent or aggressive situations, Pease said.